Unless I completely miss my guess, most Americans have come to think of tabbouleh as primarily grains flecked with parsley. But in Lebanon, where our food appreciation classes currently find themselves on our virtual world culinary tour, there is a long tradition of herb salads. 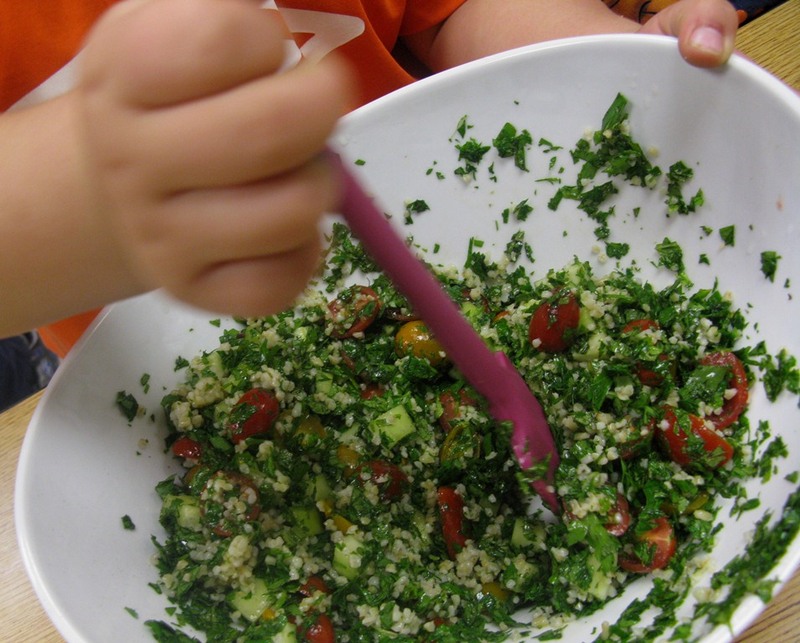 The most famous throughout the Middle East–tabbouleh–in fact comes to the table as mostly parsley and other greens. The grain–usually bulgur wheat–is merely a side note. 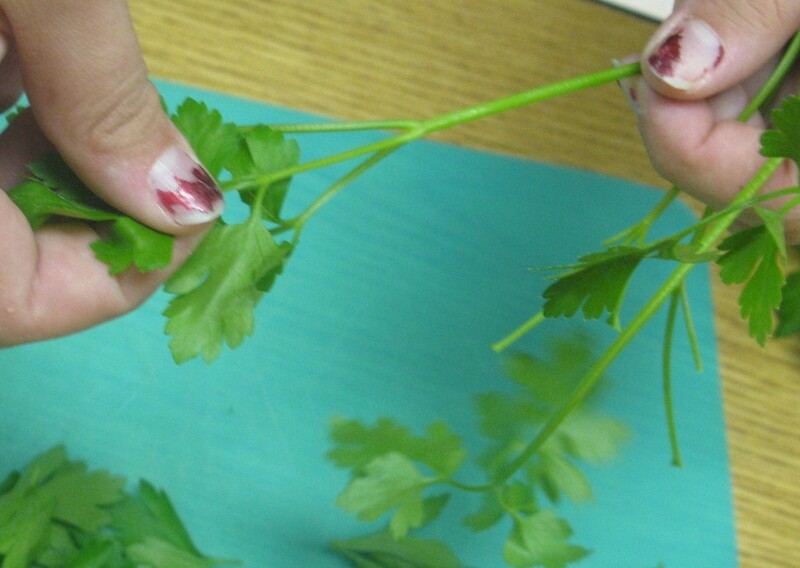 So it was that the kids in our classes engaged in what could rightly be called The Great Parsley Project. All told, we spent several hours picking the leaves off parsley stems. Yes, in our world we go for the leaves. The stems end up in the compost pile. The subject of how much parsley deserves some attention. The trend at the supermarket these days seems to be bigger and bigger bunches of parsley–and here we are talking about the flat leaf variety. At our local Whole Foods, for instance, parsley bunches have grown to the size you might expect from a bouquet of flowers. So when we call for “two bunches” of parsley in this recipe, that is what we are referring to. Once the leaves have been picked and chopped moderately fine, you should have about 2 cups. That’s a lot of parsley. In fact, we started our tabbouleh experiment not chopping the leaves at all. But the kids agreed that eating it wasn’t what they hoped for: too leafy. Then one of the girls whose family comes from Lebanon piped up to say her mother chops the parsley fine. That was all we needed to change course and the end result was terrific–everything you’d expect from a first-class tabbouleh. As far as the bulgur goes, this is a parboiled wheat product made from cracked grains and often sold in the bulk section of the supermarket. It looks very similar to oat groats. Being parboiled, bulgur doesn’t need to be cooked so much as steeped in boiling water. We place 1/3 cup in a medium-size mixing bowl, pour in 2/3 cup boiling water, then cover with a pot lid that fits snugly inside the bowl to trap the heat. The bulgur will absorb the water in about 1/2 hour. If it hasn’t, you can finish the job in the microwave. The bulgur just needs to be plump and tender. To make enough tabbouleh for a family dinner, prepare the bulgur as described above. While the grains are steeping, pick the leaves from 2 large bunches parsley and chop moderately fine to make about 2 cups. Similarly, prepare the leaves from 1 large bunch mint and add to the parsley. To the herbs add 1/2 large cucumber as follows: peel the cucumber, slice in half lengthwise, scoop out the seeds with a spoon. Slice the two halves into long batons and cut into bit-size pieces. Add to the herb mix 1 cup or more cherry tomatoes, halved, along with the juice from 1 lemon. Stir in the prepared bulgur, mix well with about 3 tablespoons extra-virgin olive oil and season to taste with salt and freshly ground black pepper. This would make an excellent accompaniment to the lamb kebabs we prepared last week. Notice we didn’t have any onions in our tabbouleh and I like it much better that way. Not nearly so strong as what you typically find and you really get the other flavors–especially the mint, which I prefer to the overpowering onion. As for spelling, it’s t-a-b-b-o-u-l-e-h: two b’s, one l.